Asparagus is, for me, the queen of vegetables, and it’s best eaten with the fingers as fresh as possible. The first UK asparagus crops are harvested in late March, but the best of the season is from April to mid-June. Traditionally, it would not be cut after the longest day of the year, so that the plants can replenish their crown reserves for the next year. Asparagus grows as shoots (‘spears’) from a crown or rhizomes (underground stems) just beneath the soil. These crowns take three years to start growing harvestable shoots, which are cut early in the morning, as they develop each day. The thicker ‘spears’ usually grow on the older crowns of asparagus, and the thinner ones are from the younger crowns. Shopping: To judge whether asparagus is fresh and good quality just look at the small bracts, or leaves, which grow just behind the tips. These should be well formed, lie flat along the stem, and not be shooting. The cut at the base of the spear should appear fresh and feel hard rather than spongy. This cut end is often tough and should be broken off before cooking. Just bend the spear near the cut end and it will snap off crisply leaving the tender spears for cooking. Don’t throw away the tougher ends. Add them to stocks and soups as they are full of flavour. Cook in the traditional way in an asparagus steamer. Griddle them. Prepare and wash the asparagus and put straight on a very, very hot griddle. It’s essential that the griddle is smoking before putting on the asparagus. Griddle for 2 minutes on one side and then turn over to griddle for two more minutes. Serve at once. The asparagus should be a brilliant green with a touch of burnt. Bake in a hot oven with the asparagus rolled in extra virgin olive oil and sprinkled with a little Malden sea salt. 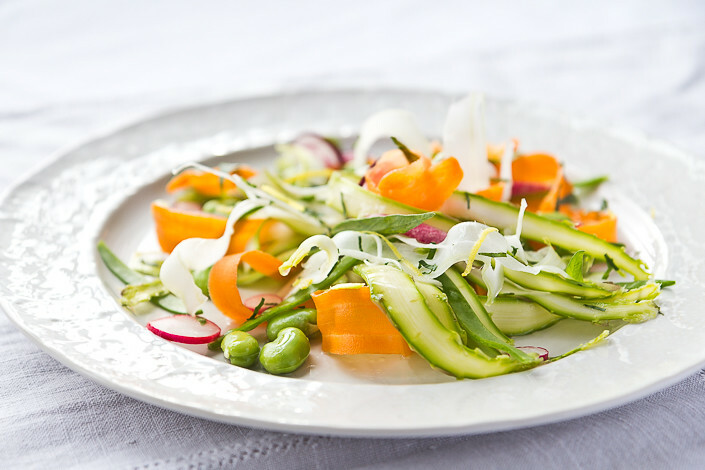 You can find more asparagus recipes and tips in Rachel's column in Vegetarian Living Magazine. My favourite asparagus recipe at present is an attempt at a vegetarian bacon sandwich. Hugh Fearnley-Whitingstall chose the archetypal bacon sandwichas his last meat dish before he had 4 months of a veg only diet that led to his entertaining TV series “River Cottage Veg” and his excellent accompanying cook book. In the end, after preparing the bacon sandwich, he chose to give it to his colleagues instead. It led me to wonder what a vegetarian “bacon sandwich” would consist of. I’m not a fan of fake meats. I did think of perhaps using tempeh as a starting point but in the end I chose a sandwich of home-made white sourdough bread with griddled halloumi and asparagus delivering smoky saltiness and olive oil cut through with a squeeze of lemon and a few cherry tomatoes. Nice. That Asparagus & Goats Cheese Salad with Tarragon Vinaigrette is legendary - I’ve made it many times since we made it at the French Cookery Holiday, even going so far as to make my own goats curd so as to replicate the experience. It’s just a beautiful dish, and the tarragon really makes it I think. Haloumi and asparagus sounds so good, that will be supper tomorrow. Had lunch at Rustico Bistro Italiano in Bath during our Spring heat wave and sat out in the sun eating Asparagi e uova Gratinated asparagus with truffle oil and fried free range egg. It was rich, but with bread to mop up the cheesey oil, it was delicious and in the hot sunshine, could have been at a pavement restaurant in Rome.